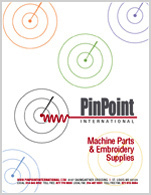 PR600 Clamping System - Use on single head embroidery machines only. The lowest profile clamping system on the market, the PR600 was designed for the Brother PR600 Series. Can also be used with Brother 620, 650, 1000 and Babylock model machines. The unit attaches directly to the drive bar/drive rail fo the embroidery machine. The clamp stays on the machine while preparing or removing embroidery items. Changing window sizes is quick and requires no tools. A single lever opens, closes and locks the clamp. The spring loaded clamp automatically adjusts to fabric thickness. Use on purses, lunch bacs, knit caps, Christmas stockings, straps, pockets and other smaller, hard to hoop items.